Debby McLachlan has strict instructions: no big purchases, because her tiny condo is already jam-packed. So we’ve arrived at the Aberfoyle Antique Market about mid-morning, coffee in hand, “just to look.” Still, there’s no question we’ll take home something we love from the tempting treasures in front of us. 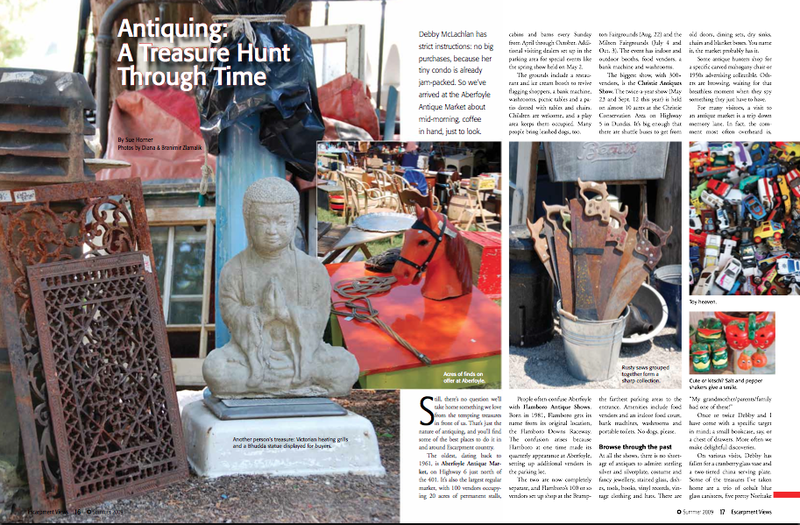 That’s just the nature of antiquing, and you’ll find some of the best places to do it in and around Escarpment country. The oldest, dating back to 1961, is Aberfoyle Antique Market, on Old Highway 6 (Brock Road 46) just north of the 401 near Guelph. It’s also the largest regular market, with 100 vendors occupying 20 acres of permanent stalls, cabins and barns every Sunday from April through October. Additional visiting dealers set up in the parking area for special events like the spring show held on May 2. The grounds include a restaurant and ice cream booth to revive flagging shoppers, a bank machine, washrooms, picnic tables and a patio dotted with tables and chairs. Children are welcome, and a play area keeps them occupied. Many people bring leashed dogs, too. People often confuse Aberfoyle with Flamboro Antique Shows. Born in 1981, Flamboro gets its name from its original location, the Flamboro Downs Raceway. The confusion arises because Flamboro at one time made its quarterly appearance at Aberfoyle, setting up additional vendors in the parking lot. The two are now completely separate, and Flamboro’s 100 or so vendors set up shop at the Brampton Fairgrounds (May 9 and Aug. 22) and the Milton Fairgrounds (July 4 and Oct. 3). The event has indoor and outdoor booths, food vendors, a bank machine and washrooms. The biggest show, with 300+ vendors, is the Christie Antiques Show. The twice-a-year show (May 23 and Sept. 12) is held on almost 10 acres at the Christie Conservation Area on Highway 5 in Dundas. It’s big enough that there are shuttle buses to get from the farthest parking areas to the entrance. Amenities include food vendors and an indoor food court, bank machines, washrooms and portable toilets. No dogs, please. At all the shows, there is no shortage of antiques to admire: sterling silver and silverplate, costume and fancy jewellery, stained glass, dishes, tools, books, vinyl records, vintage clothing and hats. There are old doors, dining sets, dry sinks, chairs and blanket boxes. You name it, the market probably has it. Some antique hunters shop for a specific carved mahogany chair or 1950s advertising collectible. Others are browsing, waiting for that breathless moment when they spy something they just have to have. Once or twice Debby and I have come with a specific target in mind; a small bookcase, say, or a chest of drawers. More often we make delightful discoveries. On various visits, Debby has fallen for a cranberry glass vase and a two-tiered china serving plate. Some of the treasures I’ve taken home are a trio of cobalt blue glass canisters, five pretty Noritake dessert plates and a heart-shaped wood mold that might have made maple sugar treats. Doug Lane of Stoney Lane Antiques bought the Aberfoyle Antique Market in 1983. Although he used to sell antiques — chairs in particular still catch his eye — these days he concentrates on administering and promoting the market. Nostalgia is big as well. Visitors find memories with a modern twist at Lorne Young‘s booth. Now 75 years old, Lorne has been at Aberfoyle since it opened, missing only two Sundays. He specializes in decades-old telephones, lovingly refinished, polished and reworked to plug into a modern jack. The phones are completely functional and are guaranteed for 10 years. The Richardsons and their partners buy furniture, glass, china, porcelain and toys, which they spread over nine booths. Last spring, the partners scored some ’30s art deco pieces from a hotel on Lake Joseph, and this winter they scouted out some old library and office specialty filing cabinets. Ah yes, the weather. 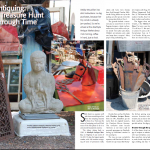 While outdoor antique shopping is most comfortable in warm, dry weather, a little cold or rain doesn’t stop the fun. Aberfoyle vendors are willing to bargain over prices that are already fair, but you’ll have less competition on a cold or rainy day. Aberfoyle averages about 2,500 visitors and may welcome up to 4,000 on a Sunday, and even a wet day will draw 1,000. Wed. to Sun., 9 a.m. to 6 p.m.
May 23, Sept. 12, 8 a.m. to 5 p.m.
Open 7 days a week, 10:30 a.m. to 5 p.m. or by appointment.